Michael Lane, Police and Crime Commissioner for Hampshire, Isle of Wight, Portsmouth and Southampton has put evidence at the heart of decision making in his office. In 2016, he presented to the public a police and crime plan through which use of evidence is woven. Whilst the development of new and more accurate ways of capturing evidence is at the heart of the performance and information team, the culture of validation and evaluation has been enhanced throughout the office. This week is National Evidence Week, and so it seems like a good time to discuss some of the things that we have been working on to support the most targeted and effective delivery of our of statutory duties to keep communities safer. Choices that need to be made to protect and support communities are shaped by information from many directions, all of which need to be evaluated and considered within a local context to ensure that the best resource available is provided where it matters most. Alongside high-harm crime (serious sexual assaults, homicide and modern slavery for example) and volume crime (vehicle offences, theft, public order) there is also a matter of public confidence and feeling of safety which can be impacted by anti-social behaviour. The groups are not completely independent from one another, and so accurately identifying experience of residents requires a range of approaches to obtaining evidence. If you attend large community events over the summer you might see our stand, complete with our communications team and Youth Commission handing out surveys. These surveys generate thousands of responses throughout the year and enable us to understand the immediate concerns of the public. There are also opportunities to engage with us in person and seek further information, which provides insight to some of the issues that we wouldn’t be able to capture in surveys. We supplement the same surveys but in greater detail every six months with seven consistent and three updated questions to capture feedback on topical issues. Apart from indicating the areas in which young people feel most concern, the surveys ask for the reason for that selection and suggestions to make managing difficulties in that area easier. Recently, we worked with the Youth Commission to code their responses to provide detailed insights to the Department of Education. You can read their letter and see the data dashboard here. In coming weeks, we will regroup to think about how the Youth Commission can add valuable insight to the work of the Advertising Standards Agency in their consultation about harmful gender stereotypes in advertising, giving youths in our area a chance in influence governance of social responsibility. Although access to data across partners is achievable, it often takes time to compile. Our position and the range of partners that we work alongside enables us to coordinate research across the landscape of organisations that work with risk of harm and vulnerability. Recently, we brought together the services involved in road safety, from fire and rescue to local councils, utilising knowledge from police, ambulance, highways and others to identify opportunities to make changes that could make the roads safer. We included topical survey questions to gauge self-assessment of how people react to speed signs that show the speed you are travelling at. The geographical variance we found will inform discussions about where they might be most effective and influence behaviour. “It’s fascinating to see these conversations between agencies and services, each using data that is so persuasive that with one source of evidence alone you could have one distinct view of the victims and then the types of services that they need. But then you bring in another set of evidence and you learn something completely different. We need these contrasts to understand how people behave and who they go to, and why, to seek help”. It is these types of contrasts and developing a shared, more comprehensive understanding of information collected that we hope to produce through our data product to support Community Safety Partners and statutory partner agencies (Police, Fire and Rescue, Probation, Health and Housing). This level of understanding supports the use of evidence when our performance team come to test realised delivery. InterACT uses visualisation software to enable us to manage large amounts of data which is presented in a range of interactive charts and graphs enabling self-service searching and printing. If we need to profile crime by a key feature, such as rural crime or crimes with a domestic violence element, this is easily achieved using filters. The core purpose is to reduce the time demand in sourcing data and identifying shifts in trends. Data from ten partners can be compared and contrasted by geographical area, down to ward level. The product is purely strategic, however the speed at which information can be sourced will focus attention to areas it is needed most at speed. Coupled with our case management product, SafetyNet+, we can move from strategic problem identification to slick protection and safeguarding of vulnerable people through good communication at pace. This enables the Community Safety Partners to use consistent, shared evidence sources coupled with survey data to provide detailed strategic assessments and a comprehensive intelligence picture. Demand for services is consistently competitive. To understand what works, we need to be sighted on recent research publications. This includes global research on areas such as restorative justice, research about services which can effectively create the best outcomes for society when managing offenders and the development of crime types that see no geographical boundary including cyber and human trafficking through to the local nuances of how a particular community can best engage with a particular scheme. To achieve the best standard whilst covering a range of topics, we have recently collaborated with Winchester University, offering placements to Masters Students reading criminology and accommodating the particular area of expertise they bring to help us examine service concepts in greater detail. 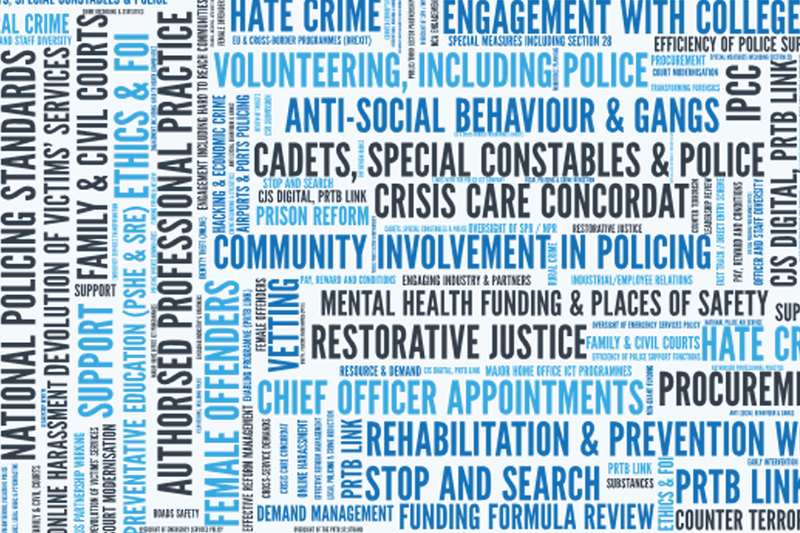 Current projects include a case study of application of restorative justice in domestic abuse cases, the service provisions for women in prison, understanding the options for capturing the child’s voice for victims and a detailed look at changes in trials at Winchester Crown Court. From September, we will be opening the offer to other universities within the policing area with opportunities both at post and under graduate level. We hope this will offer strong insight to the office to those progressing into areas of the criminal justice system or victim services. Findings from all of these projects are shared with Hampshire Constabulary through the Commissioning Board. This enables us to work effectively together, offering constructive challenge and creating insights that directly contribute to public safety. Recently we also heard from Neighbourhood Watch and Citizens Advice, and there are many more organisations that can offer insights that we could never achieve by ourselves. Coming years will see focused efforts to provide a platform for those who would benefit from working with us and our partners. During each board we set priorities which we consult with the public on. Recently we sought views on the use of out of court disposal orders in relation to hate crime such as restorative justice pathways and community resolution – the outcome of which will inform the policing hate crime strategy. Changes in crime are fast paced, and some of the most at risk just need the correct information to help keep them safe. We know this to be pertinent in the business community, particularly for smaller businesses where a single cyber-attack could result in loss of the business and wider reaching impact on families. Through the business forum, we can take the learnings from larger more established organisations to share with smaller businesses. We conduct surveys which parallel larger, national surveys so that we can compare trends in the Hampshire policing area to the rest of the country.